Flesh-eating zombies on campus. A virus gone wild. Does one college freshman stand a chance against the undead? Shy co-ed Jane looks forward to her isolated night shifts at the school radio station. It’s the only place she can escape the bullies and quiet her anxiety. When rumors spread of a viral epidemic ripping through the wintery campus, she’s happy to be safe in the snug studio. But after communications go down and the infected break into the station, her peace turns into panic. Fearing for her life, Jane’s only path of escape runs through the dark, snow-covered campus. But it may be too late to escape the gaping jaws of the walking dead. Does Jane have the grit to fight off the zombies and outrun the apocalypse, or will flesh-eating terrors teach her a deadly final lesson? 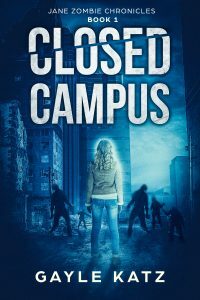 Closed Campus is the first installment in the Jane Zombie Chronicles, a series of young adult horror books. If you like feisty female heroines, spine-chilling undead, and pulse-pounding action, then you’ll love Gayle Katz’s post-apocalyptic novel. Buy Closed Campus to crush the zombie exam today! Sign up for our newsletter to find out about great mystery books. Once a month one subscriber will win one book from our site.